Secretary of State for Foreign Trade Pieter De Crem participated in the summit between the European Union and the ACP countries in the Togolese capital Lomé from 29 to 31 May. 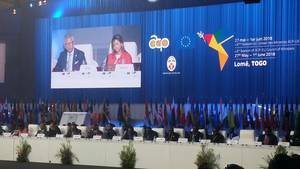 The ACP group consists of countries in Africa, the Caribbean and the Pacific that have a special relationship with the European Union. Cooperation between the EU and ACP countries is an important aspect of EU foreign policy and the Lomé conventions, followed by the Cotonou agreement, created a solid partnership. Secretary of State De Crem explained the Belgian candidacy for the UN Security Council. The campaign for the Belgian candidacy has been running for some time and continues despite the Israeli withdrawal. Belgium wants to achieve the best possible result in the vote on 8 June, which is line with the Belgian intention to commit to the public interest within the Security Council, corresponding with our years of strong engagement within the UN. Furthermore, Secretary of State De Crem had a series of bilateral meetings with ACP countries, and explained the Belgian position regarding the ACP-EU partnership after 2020.